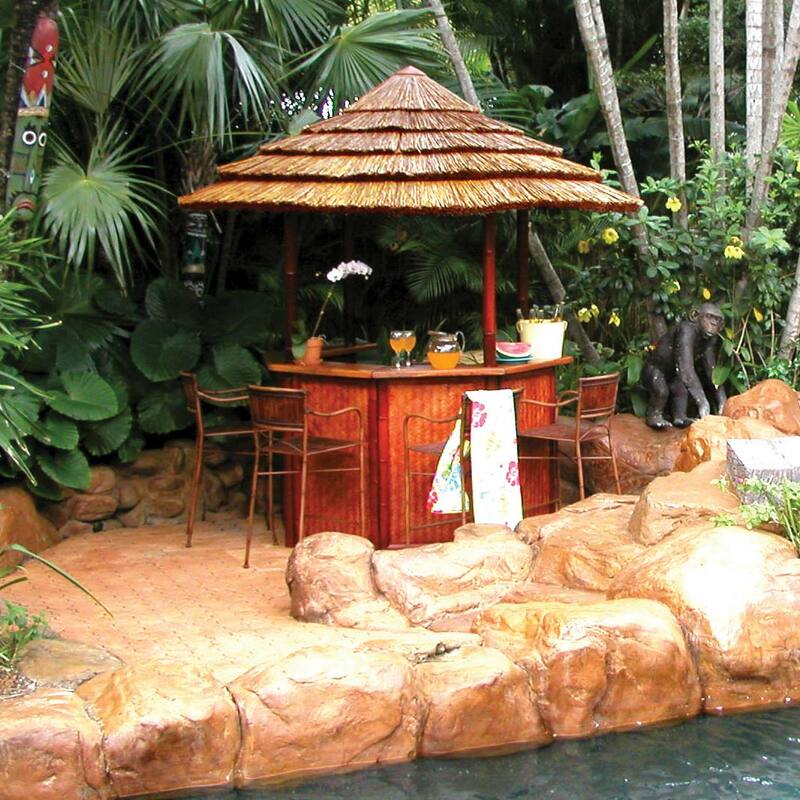 Bar: Bimini Bar This 5-½ft wide bar has an 11ft dia thatched roof with your choice of thatch. Ample shade, beautiful GRASSBuilt bamboo countertops, and bamboo plywood facades all come standard, and provide truly stylish outdoor entertaining. Highly resistant to harsh weather, this bar is built to last. Replacement thatch is easy to order and install. Personalize your purchase with custom resin-pour counters, different types of thatch, and custom installed appliances. Appearance: Medium sized octagonal bar w/ an 11′ dia thatched roof. GRASSBuilt bamboo countertops, and bamboo plywood facades provide truly stylish outdoor living. Grade (Int. vs. Ext. ): Perfect for both interior and exterior spaces, although at just under 10ft high, interior uses are limited. Durability: Highly resistant to extreme weather conditions, this bar is built to last a long time. The roof lifespan will vary depending on the thatch option you chose, but replacement thatch is extremely easy to order and install. Seats: Seats 6 people plus bartender very comfortably. Includes: Includes 6 bar panels, 4 poles, 1 galvanized umbrella frame set, thatch, hardware, and complete set of installation instructions. Chairs are sold separately. Ease of Installation: Moderate difficulty. Requires 2-3 people, and may take several hours. Complete detailed installation instructions are included with your purchase. Custom Options: Custom resin-poured, or Safari’s GRASSBuilt engineered bamboo, electrical outlets, and choice of Reed Thatch, Synthetic Palm Thatch, Tahiti Thatch, and Mexican Raincape. Talk to your sales rep, as most customer requests can be accommodated.